This entry was posted in News, Sports on February 6, 2019 . Atlantic University Sport confirmed the suspensions of 15 men’s hockey student-athletes and both head coaches following what they called a violent altercation which broke out during the third period of an AUS hockey game between StFX and Acadia on Saturday. Six student-athletes from the Acadia Axemen, nine from the StFX X-Men, and both team’s head coaches received automatic suspensions totalling 39 games as a result of the altercations. The suspensions are effective immediately. The AUS stated such suspensions are usually handed out shortly after the game but given the number of people involved, they and the AUS hockey chair felt it needed time to review all available materials. Acadia head coach Darren Burns and X head coach Brad Peddle each received two game suspensions. 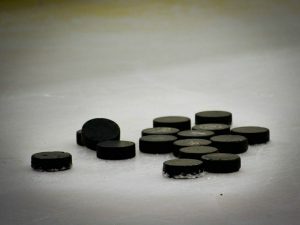 X players Regan Spears, Sam Studnicka, William Thompson, Nathan Pancel, Mark Tremaine, William Bower, Bailey Webster and Cole MacDonald each received two game suspensions while Aaron Hoyles was suspended for five games. With the automatic suspension out of the way, the AUS’s disciplinary process is set to continue with supplementary discipline to be determined following what they call a more extensive review. AUS executive director Phil Currie filed official complaints to the sport chair on five student-athletes and three coaches involved in Saturday’s incident based on the initial review of the video evidence. The release also mentioned allegations made by StFX that a player was the target of comments relating to the shaming of a sexual assault survivor. The AUS called the allegations serious and something they will investigate thoroughly as part of the secondary review. Currie called the allegations troubling, adding such comments will not be tolerated.